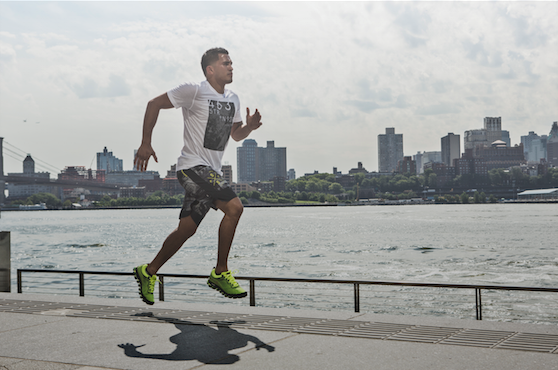 On Thursday, July 17th, UFC Lightweight Champion and Reebok athlete, Anthony Pettis took a select group through an intense speed and agility workout, modeled after his own dry land training along the East River bike path in NYC. As Anthony is prepping to defend his title in December, he understands how important raw, explosive speed can be, which is why he’s been training in the brand new Reebok ZJET. Like the way the jet engine blast is created by moving air from high to low-pressure compartments, the new ZJET enhances your running by moving trapped air in an underfoot current for maximum cushioning. Paired with extreme flexibility and Nanoweb upper construction for stability, the ZJET is the ultimate in maximum cushioning providing unsurpassed comfort and quickness so you can jet up or down the open road. Reebok ZJET is now available at Finish Line and Reebok.com, and retails for $130. Print article This entry was posted by Art Eddy III on July 24, 2014 at 12:00 pm, and is filed under Uncategorized. Follow any responses to this post through RSS 2.0. Both comments and pings are currently closed.